When a bloodthirsty supernatural being that lurks in the shadows preys upon a family, a young woman must fight to protect herself, save her little half-brother, and uncover a mystery about her family's shadowy past. 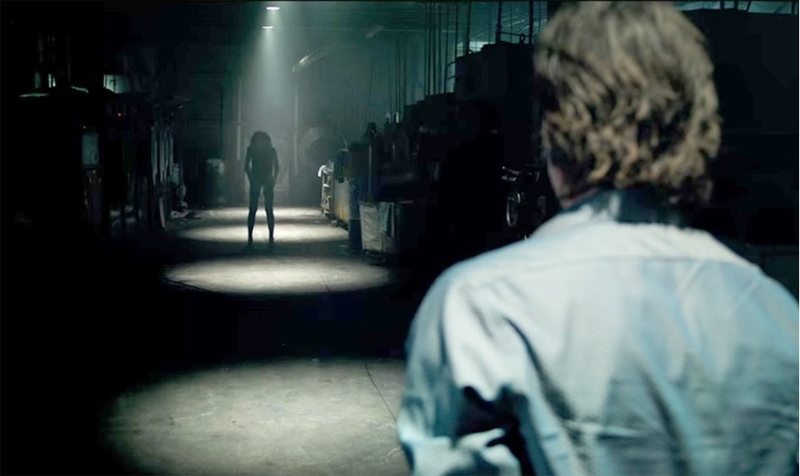 Critics Consensus: Lights Outmakes skillful use of sturdy genre tropes -- and some terrific performances -- for an unsettling, fright-filled experience that delivers superior chills without skimping on story. This time it is all mom's fault. ©Warner Bros. So in 2013 David F. Sandberg made creepy little video about a woman who on her way to her bedroom turns off the hall lights and begins to see a human silhouette in the dark. Turning on the lights makes it go away but turning it off again brings it back. Anyway, I think it's better that you watch it instead of me writing it out. The little short was popular enough in Hollywood that apparently it got the attention of Lawrence Grey who took it to the current master of all things horror, James Wan who although he liked the short didn't think it would work as a feature length film. But a feature length treatment by Sandberg did the job of convincing Wan and he and his wife Lotta Losten quit their jobs and left Sweden for Hollywood. When they arrived they lived in Airbnb homes for a while. And in fact when production started Sandberg had no idea how to handle it as it was his first time working on a production of this magnitude. You can read more about Lights Out here. You work in a factory full of mannequins that alone will give anyone the creeps. ©Warner Bros. 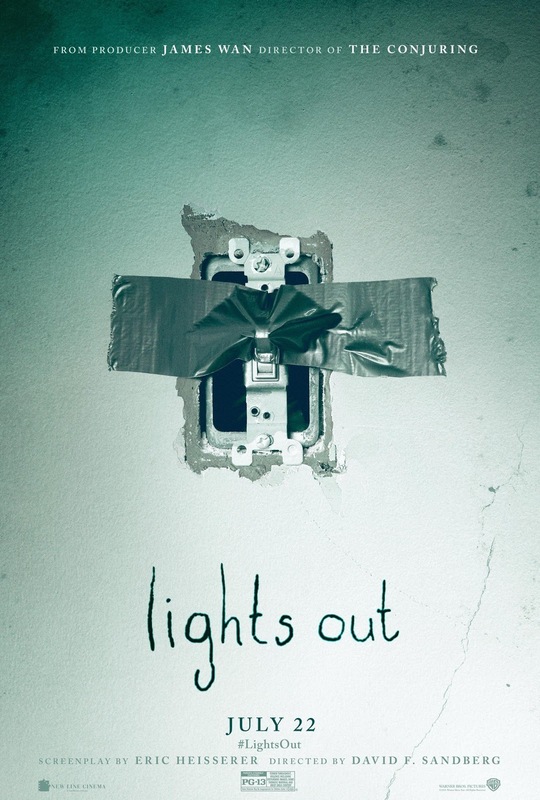 Anyway, this feature length Lights Out if you still have yet to see it is about a particular family who have been, bothered I guess is one way to put it, by a malevolent presence in their home. 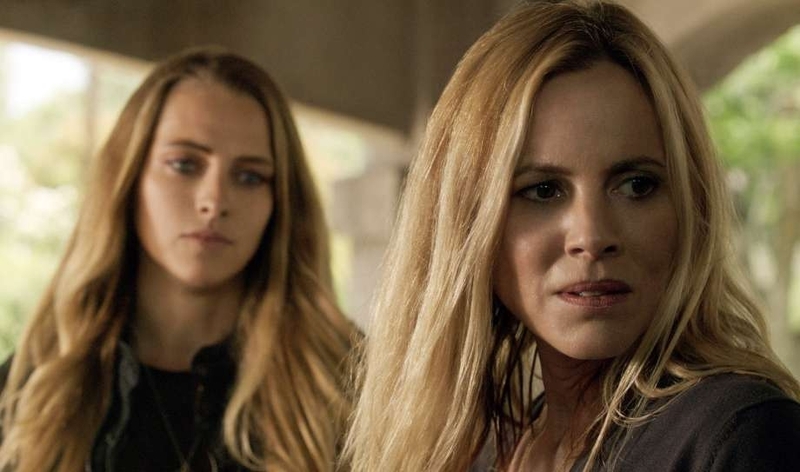 The presence is intrinsically and emotionally linked to the mother of the family Sophie (Maria Bello), things begin to get worse when her current husband Paul (Billy Burke) is murdered one night in his clothing factory. Soon even her young son Martin (Gabriel Bateman) is feeling threatened by it and goes in search of his step sister Rebecca (Teresa Palmer) to escape it. And then this thing shows up. ©Warner Bros.
Rebecca confronts her mother over what's going on in the house and when she doesn't get a clear answer from her mother she takes it upon herself to search the house for clues. During her search she is assaulted by the presence and finds a possible clue to what it may be. She finds out that her mother has suffered from severe depression since she was a child and was placed in an institution for a time. At the institution she befriends a girl who suffers an unusual condition where any exposure to sun or bright lights will cause severe burns. Before this girl arrived at the institution she spent most of her life confined to the basement by her parents and when they found her they also found her father dead apparently murdered by her. She was classified as extremely violent by the institution. Their attempts to cure her unusual condition culminated in her being strapped into a chair and exposed to extremely bright lights. The lights caused her to spontaneously combust. 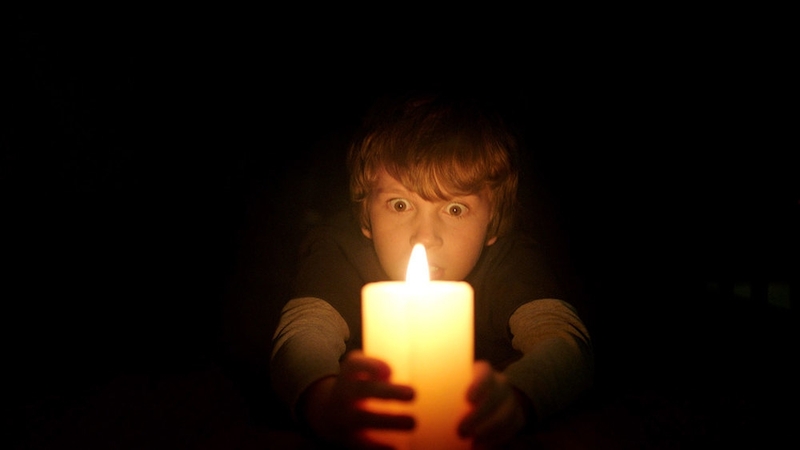 Candles, a contributing factor to many fires in the home and a good weapon against the creeps. ©Warner Bros. Anyway here's the likes and not so likes. The scares. Although it's the usual tropes and techniques it's done very well. We've all had that feeling late at night of not being alone in an empty house, of seeing things in the corner of your eye or shapes when the lights are turned off. Lights out takes that and puts it on screen pretty well. The acting. The main cast does a pretty good job with their roles. Pretty convincing throughout. The visuals. Done very well. Very atmospheric and brilliant use of lights both in the set-up of the scenes as well as in the scenes when the characters are using lights as weapons. When things that go bump, creak and anything else start leaving their names, you've got a problem. ©Warner Bros. The story. It starts off ok then it becomes predictable. It's a problem all horror films have. Also the reason for the existence of the evil presence is a bit hackneyed. The evil presence. You've seen her before. From the way she moves to what she does. It's been done before. So it becomes predictable. Overall it's an enjoyable movie. It's more of the usual if you've watched enough horror movies but it's done very well. For a first time director who went from making film shorts with things everyone can afford and jumping to a full-length big Hollywood studio backed film it's an impressive first film. Hopefully Sandberg gets to fine tune his skills with better stories to work on in the future. I enjoyed the film so I'm giving it a decent 3 out of 5.